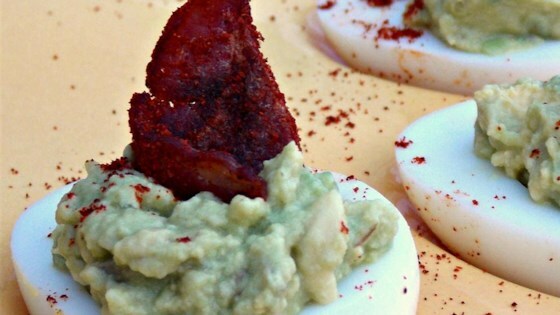 "Fun way to spice up a boring deviled egg. These eggs are filled with a spicy guacamole with a little egg yolk mashed in, and topped with bacon." Cut each egg in half lengthwise. Scoop egg yolks out; place 3 to 6 egg yolks in a bowl, reserving remaining egg yolks for another use. Mash the 3 to 6 egg yolks with a fork; stir in avocado, lemon juice, cayenne pepper, and garlic. Season with salt and pepper. Arrange egg whites cut-side-up on a serving platter. Spoon avocado mixture into egg whites. Chop bacon into 1/2-inch pieces; place bacon and paprika in a small bowl and toss to coat bacon. Top deviled eggs with bacon pieces. This could be made using veggie bacon, turkey bacon, or bacon bits, using no yolks or salt, or by adding all the yolks and using real bacon. It's your choice - they both taste amazing and your friends will love your Green Eggs and Ham creations! The nutrition data for this recipe includes the full amount for the eggs. Because some egg yolks may be reserved for another use, the actual amount of egg yolk consumed will vary. Nobody really cared for the paprika on the bacon, but everyone liked the avocado. These would be fun for St. Patricks day.